For me, Glossier has always been this cool brand that makes skincare attainable while being physically unattainable (for now). Let me explain this: they are super active on social media, always looking to improve or create products with people's feedback. The unfortunate part is that because they are so popular (and still so new), they haven't been accessible for all their worldwide audience YET. Let me tell you how hard it's been for me to follow them for years without being able to try their products. Actually that is not true... a year ago or so, I ordered the Balm Dotcom trio that was available on Net-à-Porter. It quickly became one of my beauty staples but that was it. A few months ago they announced that Glossier would now ship to Canada, but not Quebec yet because of French translation laws. Then a few weeks ago, I was in New York and I almost went to their showroom, which is something I regret not doing. And one thing you have to know is that the CEO and founder of the brand, Emily Weiss, is truly my style icon and girl boss icon. I probably read and saw every interview she did and I'm an avid Into The Gloss reader. This long introduction brings me to when I discovered that they were having a pop up shop in Toronto while I was in Toronto. It opened at 12 pm and I was in line by 10:30 surrounded by cool girls of the 6ix. I actually thought I would meet Emily Weiss, that would have been my dream, but she wasn't there and I still had an awesome time. 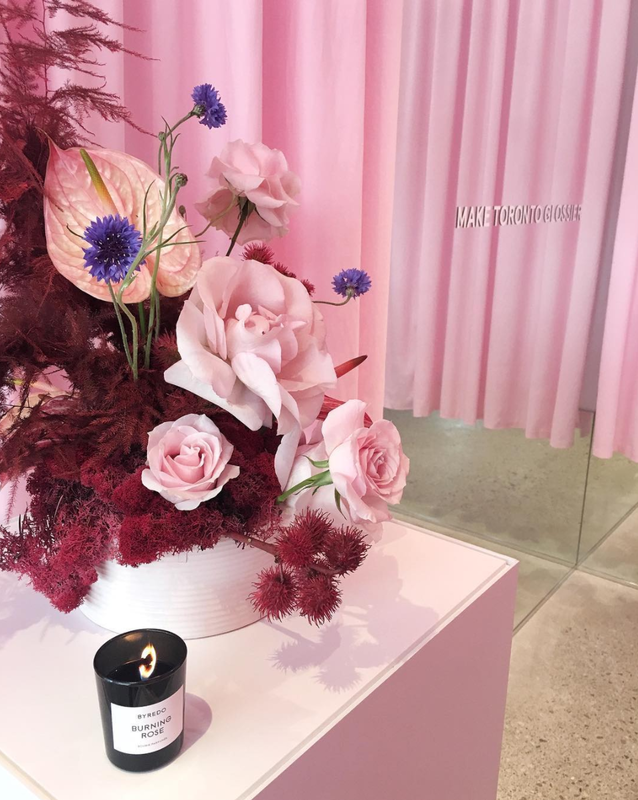 They set up this dreamy pop up with lots of beautiful flower arrangements, everything was pink, their staff was wearing amazing uniforms, the playlist was incredible and they were burning my now favourite scent: Byredo's Burning Rose. So yeah it was pretty magical! I got my hands on the Phase 1 which includes the Priming Moisturizer, the Balm Dotcom (of my choice) and the Milky Jelly Cleanser in their iconic pink pouch with stickers. For some reason they charged me less than the announced price and I was so happy with my order. I regret not buying more but I know my aunt lives in Ontario so I can always use her address if I need it! I LOVE the phase 1 set! As a lover of skincare, this is just the solution for a simpler and more efficient routine. The Milky Jelly Cleanser is the best cleanser I have ever used. I love the scent, it leaves my skin feeling so clean yet not stripped down. Since I've started using it, I've enjoyed the "cleansing" step a lot more, and I will be sad when I run out of it. The Coconut Balm Dotcom just has the best smell, it makes me want to eat it and re-apply it all day. The Priming Moisturizer is perfect as a day moisturizer because it absorbs very quickly. I am chuffed with it and I cannot wait to try more products and discover their new launches. 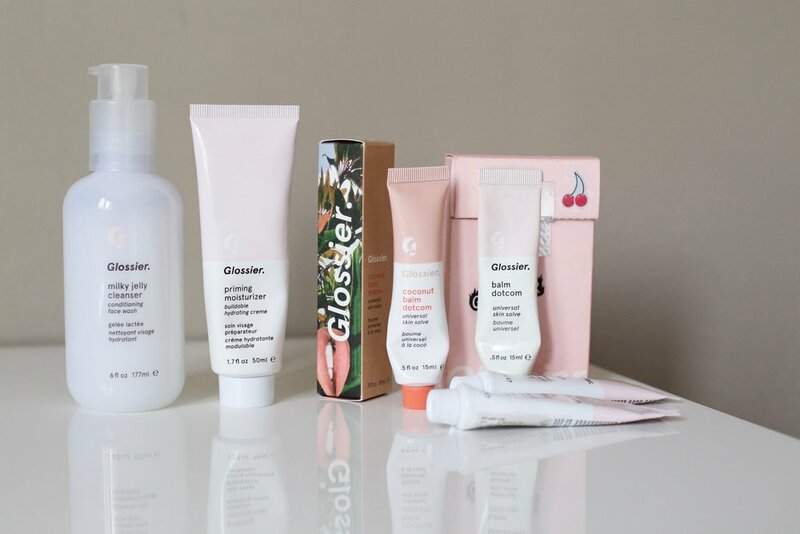 Have you tried Glossier products? Any favourites?